A picture shared by Virender Sehwag to wish Virat Kohli on his birthday. Virat Kohli turned 30 on Monday with wishes pouring in from all corners, but it's one from former Indian opener and current Twitter comedy king Virender Sehwag that takes the cake. 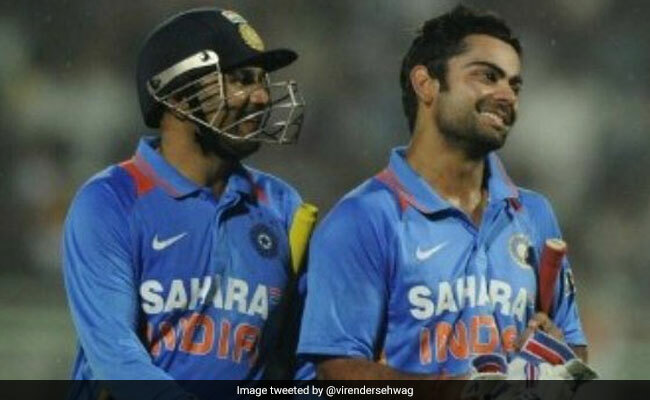 About one hour ago, Virender Sehwag took to Twitter to wish Virat Kohli on his birthday in his trademark hilarious style. "On this Dhanteras, wish you a year that is again filled with Runteras," wrote Sehwag, completing his tweet with a hashtag that has been trending on Twitter this morning: Happy Birthday Virat. Since being shared online, the witty tweet has collected over 7,000 'likes' and a ton of responses, with some praising Sehwag's humour and others wishing Virat Kohli. Virender Sehwag often wishes friends and family with hilarious tweets. In the past, his witty birthday wishes for everyone from Shah Rukh Khan to his wife Aarti have gone viral with tons of reactions. Happy birthday,Virat Kohli! We too wish you a year that is filled with Runteras.